This soup is a super-simple puree topped with freshly toasted and ground (or just smashed) cumin seeds and a swirl of olive oil. Some dried fava beans are sold with their skins still on, and those are great for other dishes but not this fava bean soup. Look for dried and peeled fava beans: they are pale yellow, not maroon or brown. The lack of skins makes them cook quickly (at least for dried beans) and purée into an insanely smooth soup. Put the fava beans in a large pot, cover them with water, and let sit overnight. Drain, return them to the pot, cover with water again, and bring to a boil. Reduce heat to maintain a nice little bubbling simmer and cook until beans are very tender, about 30 minutes (start checking them after 20 minutes–sometimes they cook really quickly). Remove any foam that develops on the surface as the beans simmer. Turn off the heat, add about two teaspoons salt, and let sit until cool. Drain, reserving the cooking liquid if you want to use that instead of stock or if you want to use it as the liquid in another soup. While the beans cook, chop the onions and garlic. You can also toast the cumin seeds now if you’d like. Heat a small frying pan over medium-high heat. Add the cumin seeds and cook, shaking the pan every now and then, until they smell, well, toasted. Take the pan off the heat and set aside. When seeds are cool, crush them in a mortar and pestle or put them in a small resealable plastic bag and smash them with the bottom of a small frying pan or saucepan. Heat one teaspoon oil in the pot, and add the onions and 1/2 teaspoon salt. Cook, stirring frequently, until the onions are translucent, about three minutes. Add garlic and cook, stirring, until fragrant, about one minute. Add cooked fava beans and four cups stock or reserved bean cooking liquid and bring to a boil. Reduce heat to simmer and cook until flavors blend and beans are falling apart a bit, about 10 minutes. Use a hand-held blender to puree the mixture in the pot or whirl in batches in a blender. Whirl much longer than you think you need to in order to get the soup to a creamy texture. Add more stock or cooking liquid to create the thickness you’d like. Taste and add salt, if necessary. 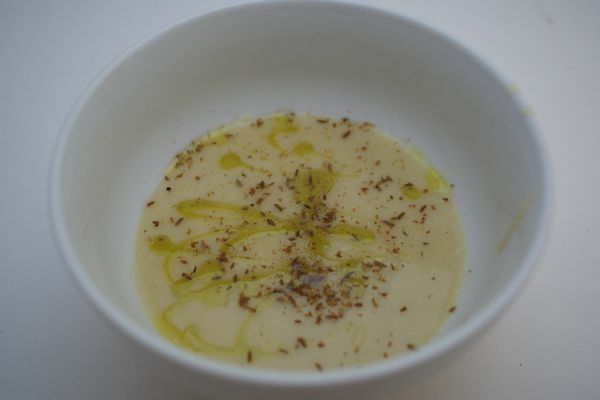 Ladle the soup into bowls, drizzle with some fabulous olive oil, and sprinkle with some toasted and crushed cumin seeds.